How Much Can You Make in a Political Science Career? What Courses Can be Taken for an Online Political Science Degree? Political science majors explore government and political power, and may concentrate their degrees in U.S. politics, international relations, comparative politics, and political theory. Students learn about the various branches of government and political structures around the world, gaining insight into why governments succeed, fail, or stagnate. Graduates with online political science degrees have expertise in areas such as political motivation, action, and collapse. They may also qualify to consult on specific nations’ political climates. The U.S. Bureau of Labor Statistics projects modest growth for political scientists from 2016 to 2026, but the field remains highly selective. With the right combination of education and experience, you can position yourself for one of these lucrative positions in Washington, D.C. or another political hub. Political scientists work not only in government, but also with think tanks, lobbying firms, and labor unions. To enter the field, most political scientists require a master’s or doctorate; a political science bachelor’s degree can be the first step for this career pathway. The following list ranks the best online political science degrees available today. We based our rankings on various factors, including graduation rates, core course offerings, elective options, and tuition expenses. Much of this data comes directly from the National Center for Education Statistics (NCES), and specifically the Integrated Postsecondary Education Data Systems (IPEDs). 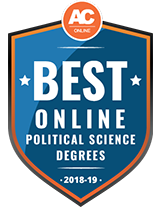 Browse the school profiles to learn more about courses, specializations, and other important aspects of these top providers of online political science degrees. The University of Central Florida (UCF) offers a Bachelor of Arts in Political Science that may be earned entirely online, though not all prerequisites or electives may be available online. This 120-credit program is available in 3 concentrations: American politics and policy, international relations-comparative politics and prelaw. Students must maintain GPAs of at least 2.0 and complete the political science exit course successfully in order to graduate. Standard UCF admissions requirements (official transcripts from institutions attended showing cumulative GPAs of 2.5 or higher and SAT or ACT scores) are sufficient to apply for this program. Career opportunities for graduates include lobbyist, paralegal and congressional office staffer. Students can earn an online Bachelor of Arts in Political Science through the University of Illinois, Springfield. This 100% online program has identical curriculum requirements to the on-campus program, which include 32 credit hours of political science and elective courses. Also mandatory is a minimum of 10 hours of Engaged Citizenship Common Experience (ECCE), a set of courses on the heritage, mission, vision and values of UIS that is a standard requirement for students. Internships are also required of all students, and they may be completed in students' own areas of residence. Incoming students must have minimum GPAs of at least 3.0 and live at least 50 miles outside Springfield. At the University of Wisconsin Whitewater, the College of Letters and Sciences offers an online bachelor's degree in political science, either as a Bachelor of Science or Bachelor of Arts. This 120-credit program is offered only as a degree-completion program, so students must have an associate degree or at least 12 transferrable general education credits upon admission. A student completing either degree is required to complete a minor as well. Online students gain access to help with career planning, the University Health and Counseling Services center and online mental health guidance. At Troy University, students may earn an online bachelor's degree in political science in 1 of 2 concentrations: international politics or American politics and public administration. The 120-credit program is intended for students who are interested in working in politics, education, government, international security, journalism, law, foreign service or the nonprofit world. Students also have the opportunity to participate in Troy's ambassador-in-residence program, which pairs students with retired American diplomats. An 18-semester-hour minor is required in order to successfully complete the degree program, and students have access to helpful resources such as online orientations and tutorials. Central Michigan University (CMU) offers an online Bachelor of Science in Political Science degree, which is comprised of 124 credits. Students may customize their programs with an option for flexible selection of courses from 5 subject areas: American national political institutions and processes, state and local government and policy, international relations, comparative politics and political theory. Students may also opt to add undergraduate certificates in complementary subjects for an additional 15 credit hours. Prospective students must possess GEDs or high school diplomas with a cumulative GPA of at least 2.0; transfer students must also transfer in with GPAs of 2.0 or higher. Along with their online applications, student must submit transcripts and GED test scores if applicable. CMU Online students may take advantage of compressed scheduling, which includes 1-week classes, as well as an online writing center, an online math assistance center, and online library and research assistance. Penn State offers several online bachelor's degrees for students interested in political science through its World Campus. These degree options include a Bachelor of Arts in Political Science, a Bachelor of Science in Political Science, a Bachelor of Arts in International Politics and a Bachelor of Arts in Law and Society. While a BS in Political Science emphasizes practical applications of political science, including statistics and research methods, a BA is more theoretical in nature, examining domestic and foreign politics. The international politics degree may be taken in 1 of 3 concentrations: international relations, international political economy and national security studies. The law and society program is primarily focused on the U.S. legal system and is geared toward those interested in legal or law enforcement careers. All 4 degrees may be earned online. The BS is a 120-credit program, while the other 3 are 123 credits each. To apply to any of these programs, students should submit their electronic applications along with high school or GED transcripts, and international students may also need to submit scores from their Tests of English as a Foreign Language (TOEFL). At the University of Nebraska at Omaha, students interested in online learning can complete a fully online Bachelor of Multidisciplinary Studies through the university's Division of Continuing Studies. The DCS is devoted entirely to working with adult learners, transfer students or those affiliated with the military. Students may earn credit via military experience or prior education. This degree enables students to design their own programs of study, including a concentration in political science. The BMS in Political Science is comprised of 40 hours of general education courses and 30 hours of political science courses, as well as courses in 2 secondary fields of interest and 26 hours of electives. To earn the degree, students must maintain at least a 2.0 cumulative GPA, with at least a C- in every general education and concentration course. Interested students should typically be at least 21, though some exceptions are granted to military students or those waiting for preferred UNO degree programs. Fort Hays State University offers a fully online Bachelor of Arts in Political Science, with the option to concentrate in legal studies/pre-law (for those planning to attend law school) or public administration. Both options are comprised of 124 credit hours. Incoming freshmen must submit, along with their applications, a minimum score of 2.0 on the Kansas Qualified Admissions Pre-College Curriculum and a college entrance exam score - 21 or higher ACT, or 980 or higher SAT. In lieu of these, applicants should show they rank in the top 1/3 of their high school class. Resources for online students include free online tutoring, access to a writing center, career services and options to participate in student government or study abroad. Arkansas State University's 100% online Bachelor of Arts in Political Science is a 120-credit-hour program that costs the same for both in-state and out-of-state students. The school allows students to double major in political science and criminology. Also, up to 9 credits may be applied to a Master of Public Administration at A-State, for students wishing to continue their studies at the graduate level. The B.A. program is accelerated, with 6, 7-week sessions running throughout the year. Applicants should submit high school transcripts showing GPAs of at least 2.75, ACT scores of 21 or higher or SAT scores of at least 990 and, for students with prior college coursework, transcripts showing GPAs of at least 2.0. Each enrolled student is assigned a teaching assistant who is experienced in the student's field of study. With an online political science degree, you can pursue career options in a variety of fields. Most political scientists work in government service, but some end up in business, journalism, public administration, law, or education. According to the BLS, the bottom 10% of political scientists makes an average of $56,150, or 33% more than the national average. No degree can guarantee a career or salary, but earning a political science bachelor’s degree online or on campus can get your foot in the door. In the following section, we look at typical careers for graduates with a political science degree. Today’s political scientists study political systems, providing analysis and expert opinion for both local and federal government, plus organizations, lobby firms, and think tanks. Daily tasks may include administering surveys, analyzing trends, forecasting results, research, and preparing reports. This job requires a master’s or doctorate. Economists study structure when it comes to economies, such as the production and distribution of goods. As a social science, economics looks at policy impact for a community or population. Economists spend much of their time reviewing data and drawing metrics. They conduct research on social issues, address economic problems, and provide guidance on how to reverse negative trends or mitigate poor results. Economists require a master’s or doctorate. Historians study the past to help uncover information, dispel beliefs, and preserve facts. With the advent of tech tools, historians use traditional materials like physical records and new media, like electronic communication. Historians spend much of their day researching, collecting data, and preparing scientific or technical reports. A bachelor’s is required for some entry-level positions. As their title suggests, urban and regional planners help develop optimal ways to use land, space, and resources for communities. They map out plans for entire towns, cities, and counties, and help define metro areas. Urban and regional planners work with government and the community to ensure compliance and to understand the environmental and social impact of their decisions. This position requires a master’s degree. Political science teachers at the university level typically need a Ph.D. To teach at a community college, a master’s may suffice. The BLS projects political scientist positions to grow by 10% over the next decade, meaning a rising demand for professors who can teach the foundational skills for political scientists. The BLS also projects above-average growth for postsecondary teachers over the same period. For political scientists, job outlook expectations correspond to geographic location. Washington D.C. naturally leads the nation in political scientist employment, accounting for more than 70% of all jobs among the top five states. Virginia employs the second-largest number of political science majors, followed by Texas, Washington, and New York. As for the highest concentration of political scientists, Washington D.C. and Virginia also take the top two spots, while Maine and Arizona rank third and fourth respectively, and Washington ranks fifth. Meanwhile, the top-paying state is Maryland, where political scientists earn a median salary of $124,590. 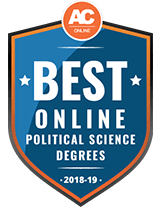 Online political science degree courses begin with a series of introductory classes or seminars on topics including political theory, analytical method, and research. As you graduate to intermediate and advanced courses, you take a more in-depth look at topics such as institutions, constitutional law, and the global economy. Many political science majors pair their degree with a minor in a related field, such as history, economics, or sociology. The sampling below includes courses you may take as part of a bachelor’s in political science program. Check with schools directly for details on courses, electives, core requirements, and degree requirements. In this course, students examine the origins and policies of government. You also get an intro to democratic thought and the different types of government through history. Topics include the U.S. Constitution, states, and branches of government. This course deals with how identity impacts various populations’ politics and allegiance. For example, students in this class might discuss the American political climate, and how Americans identify on a national and personal level. This course examines international law and its impact in the world today. Topics include sovereign equality, jurisdiction, and coalitions, like the EU, the United Nations, and NATO. Students discuss the limits of international law, and how nations enforce laws. This introductory course explores political theory and discourse. Students typically study the eras of political theory, and explore politics from literary, cultural, and historical perspectives. In this course, students take on public policy. Topics include social problems, motivations, impact, and consequences. Students explore the role of data and evidence, and how policy professionals use such information to further their objectives. Prospective political science majors should account for student outcomes, course offerings, and tuition expenses when choosing between potential programs. See below a list of five common questions aspiring political science students might ask when deciding which school is best for them. What strategies should I follow when choosing political science courses? Course requirements vary depending on the school or program, but you should expect to take courses in politics, government, and economics. Through this combination of disciplines, an online political science degree provides you with a broader understanding of political activity. Core requirements should give you a solid roadmap in your first and second years. In your third year, you can tailor your bachelor’s in political science to focus on a particular subfield, like comparative politics. What factors should I consider when searching for an online political science degree? Earning a bachelor’s in political science online represents a larger distance learning trend. More and more schools are offering online programs for traditional majors, including political science. As with any college program, you should research prospective schools’ reputations, student outcomes, and accreditation statuses. Accreditation proves especially important in establishing quality education from online programs and colleges. How will this degree in political science help me reach my goals? Political scientists need an advanced degree in order to enter the field. The BLS notes that most political scientists hold a master’s or Ph.D. To apply to a political science graduate program, you must hold a four-year degree that meets the undergraduate prerequisites. A bachelor’s in political science online program covers this requisite curriculum, and may also include important internship experience. How do internships benefit students in an online bachelor’s degree in political science? With a bachelor’s in political science, you can gain valuable practical experience. Through internships in public offices, for example, you may observe government in action and help in the political process before starting your career. Some programs include a semester or summer spent in Washington D.C. in a students third or final year. To learn about internships at your prospective school, reach out to your academic adviser. Is there a capstone requirement for a bachelor’s degree in political science? You should expect to complete a capstone requirement at the end of your program. This project requires significant research on your part, and counts as a course in itself. Capstone projects tend to reflect current political events, issues, and dilemmas. As tuition costs continue to rise, scholarships and grants become increasingly useful to college students. You aren’t required to pay back scholarship or grant money, which makes these sources of aid ideal for financial assistance. According to the College Board’s report, “Trends in College Pricing 2017,” tuition rose at both public and private four-year institutions in the 2017-18 academic year. Tuition now costs nearly $10,000 for one year at a public university. The National Forum for Black Public Administrators presents this annual award to recognize African-American or minority college students who exemplify leadership, specifically in public service. Undergraduate and graduate students may apply, as long as they are pursuing a degree in public administration or a related field, like political science. Applicants must have a 3.0 GPA at minimum. The scholarship awards $5,000, and the deadline is in May. This merit scholarship from the Daughters of the American Revolution awards two college students each year who are pursuing a major in political science, history, or economics. The applicant must be a junior or senior who has declared their major. The deadline for this one-time award of $5,000 is February 15. GFOA recognizes minority students who aspire to work in government, and specifically in finance. Acceptable majors include public administration, finance, economics, and political science. Applicants must submit one letter of recommendation that attests to the student’s experience in the public sector. The one-time scholarship awards $10,000, and has a February deadline. This merit scholarship from Attorney at Law Seth Okin is open to any student pursuing a postsecondary degree. Applicants must demonstrate community engagement and hold a minimum 3.0 GPA. The deadline for this $500 award is September 30. In honor of past president Betty Rendel, the National Federation of Republican Women awards three, $1,000 scholarships each year to female undergraduate students majoring in political science, government, or economics. Applicants must be in their junior year, and the competition is open to students from any state. The deadline is June 1.